If you are looking for an easy alternative to stuffed manicotti, this is the perfect recipe for you. Delicious Italian flavor in every bite! Preheat oven to 350 degrees F. Coat a 13×9-inch baking dish with nonstick cooking spray. Cook the noodles according to package directions; drain. Lay the cooked noodles flat on waxed paper. Cook the beef, onion and garlic in a medium skillet over medium-high heat, stirring occasionally until the meat is browned and crumbly; drain. Add the pasta sauce, bring to a boil over medium-high heat. Spread 2 cups of the sauce mixture in the prepared baking dish. In a large bowl, blend the ricotta cheese and 1 cup of the mozzarella cheese. 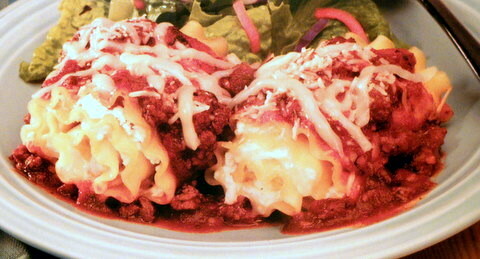 Spread about 3 tablespoons of the cheese mixture over each lasagna noodle. Roll up the noodles tightly; place seam sides down over the sauce in the baking dish. Spoon the remaining sauce over the rolls; sprinkle with the Parmesan cheese. Bake 30 minutes or until the rolls are heated through and bubbly. Sprinkle with the remaining mozzarella cheese; let stand for 5 minutes before serving.